What Are ‘Nation’ Interns Reading the Week of 3/14/2014? This week: a former barista describes life on the other side of the coffee bar, Google execs call for more encryption and researchers look at the links between animal antibiotics and obesity. —Samuel Adler-Bell focuses on labor, mass incarceration and culture. Journalist Matt Power died in Uganda on March 10, apparently from heat stroke. Sixteen years ago he was an intern at Harper’s Magazine. At the time of his death, he was a contributing editor, having written eight of the best Harper’s pieces of the past decade. In this ‘Briefing’ from December 2005, Power exposed the national media’s shameless feeding frenzy in post-Katrina New Orleans. I have always been impressed by Power's precise and vivid prose (the writer’s grail of evocative concision). This time, I was even more struck by the strength of his commitment—sincere without being pietistic—to the trade of journalism. More than a blistering indictment of the national networks’ ratings vampirism, the piece conveys Power’s reverence for really good, humane, local reporting. If the villains in this story are the 24-hour networks—peddling disaster voyeurism, schadenfreude and racial hysteria—our heroes are the journalists at New Orleans’ own Times-Picayune, who stick around their battered city to do their jobs, sleeping on the couches and floors of one staffer’s salvaged Uptown home and filing their reports from a single dial-up modem. We lost a great journalist this week. And those who believe the news ought to serve a purpose higher than network ratings and corporate bottom-lines have lost a great ally. RIP. It's very rare that the issue of cattle rustling (stealing cattle, for the unfamiliar) makes contemporary headlines in the United States. In the collective imagination of most Americans, cattle raids are associated with cowboys, the Wild West and Cormac McCarthy novels. However, the problem is very much a modern one: left-wing guerrillas in Colombia have used cattle theft to feed their troops; rural movements against social inequality have used it as a protest tactic, which is probably why the Paraguayan People's Army was blamed for this particular case; and the Honduran Rivera brothers, who head the Cachiros drug gang, used cattle rustling as a stepping stone into the world of drug trafficking. Cattle in general are a very real concern in Latin America, and not just around the issue of rustling. Cattle ranching is associated with climate change, social inequality and deforestation. Like Ben, below, I was struck this week by the sharp and thought-provoking account Molly Osberg gives of the contemporary service economy—or specifically the particular corner of it inhabited by many of the service workers of New York City. She writes about the labor that goes into serving the "creative class," labor that includes performing "a zombified bohemianism for the benefit of the rich," hiding the class differences between the server and the served. Two of her most important points are that emotional labor, disguised as fun and uncoerced socializing, is an enormous part of the job of many service workers and that it's a mistake to talk about all of the people who often get lumped together as "hip" Brooklynites as if they occupy the same class position. Some people are "hip" for fun—some people do it for $8 an hour. Osberg notes that this account, drawing on her personal history as a barista, isn't meant to be representative of the experiences of service workers generally, many of whom are significantly worse off—but it does point to problems faced by all. "I have nothing to hide," you assure yourself as you browse the net, pausing to decide whether to click on Wikileaks.com or e-mail your friend something racy. This self-affirming mantra is the political equivalent of closing your eyes and plugging your ears as a fire spreads toward you… while your neighbors are yelling "fire!" Not to sound paranoid, but it's time for us to encrypt. Eric Schmidt, the executive chairman of Google, and Jared Cohen, the director of Google Ideas, are perhaps not the most trustworthy of characters in the digital sphere, but they do provide an important insight into the role encryption plays in press freedom and daily life. As reliable data in censored countries becomes scarce, and as the fear of constant and inappropriate surveillance affects our lives to a greater extent, the solution is to work, and also play, in safe, encrypted spaces. But, as the authors aptly note, "The final challenge is usability." In New York, as in other states, cities and counties have no power to pass minimum wage laws. This summary gives a compelling argument for why they should have that power—calling for the amendment of New York’s “minimum wage law to clarify that it is a floor, not a ceiling.” Should American metropolises like New York City depend on state action to do things like raise their minimum wage? ALEC thinks so. Probably partly because of continued opacity around the Trans-Pacific Partnership, recent articles on the "trade" agreement have tended to give simple overviews rather than analysis. Case's article, however, does offer some analysis, outlining the cases for and against the TPP's supposed IP protections and siding convincingly against them. "There is no patented pharmaceutical that is not composed of AT LEAST 97 percent knowledge in the public domain," he writes and makes a similar argument about software. While most recent TPP articles have tended to be fairly country-specific, Case's perspective is also refreshingly global. "Not mentioned often in the IP debate is the fact that most nations joining the TPP do not have the infrastructure to self-enforce intellectual property rights," he writes. "This handicap to weaker nations introduces a form of imperialism into agreements, where the supposedly independent tribunals can be manipulated by wealthy US interests and clients." The Alberta government's oil-industry worship has seeped its way into education. 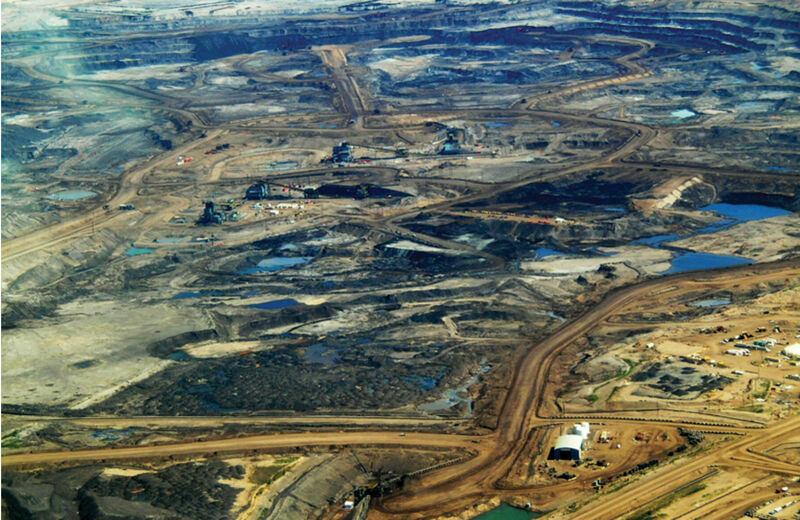 Alberta's education department, in the mist of an overhaul of its K-12 curriculum, lists three tar sands extraction companies among its "advisory partners" in some districts. The idea of oil companies providing input on curriculum is as natural as extracting oil from sand. Scarier still is the attitude of school officials, who deliver a coalmine of horrific quotes for the piece. A sample: “If we’re going to build a relevant education system, we need the voice of the employer, the business community, economic development — we need those people at the table.” As if children were nothing more than a product designed to suit employers' needs. Most of us probably know at least a little bit about the negative effects of pumping our future meat full of antibiotics and growth hormones: our mind conjures images of caged, overstuffed breasts that somewhat resemble what was once a chicken. (I, for one, feel very bad for chickens on basically a daily basis.) But what's the long-term effect of pumping us with the very same stuff? New research suggests that the well-documented (and really quite scary) overuse of antibiotics not only threatens our ability to react to disease outbreaks but may also offer some answers as to why America has gotten so fat. We now have substantial evidence that antibiotic use can positively impact growth, not only in farm animals and mouse studies but in humans too. Moreover, antibiotics kill stomach bacteria, which may impact the way we digest food. (Indeed, researchers are looking at how the bacteria each of us host impacts a myriad of health outcomes—and whether science can tailor the best bacteria to make us super-healthy super-humans.) While research is ongoing, and we don't have a definitive answer of how and whether antibiotic impacts America's weight problem, or what to do about it, this fascinating area of research is beautifully outlined by Kennedy. “We need a new rule,” writes economist William Easterly, “no democracy, no aid.” Critics of foreign aid have long argued that conferring assistance to an authoritarian regime reinforces its hold on power. Were donor nations to cut off the flow of money, the thinking goes, then presumably the starved regime would eventually either collapse or democratize. There’s an intuitive logic to this, but the data reveal a more complicated relationship between the influx of humanitarian and development assistance and the durability of a dictatorship. One important recent study examining nearly every authoritarian government from 1960 to 2002 found that, under certain conditions, foreign aid can actually spur democratic reform. Easterly’s invitation to simply abandon any country administered by a sinister tyrant is short on nuance, but it does have the wholesome effect of stimulating spirited discussion on what makes for good aid, and for this I tip my hat to the author. This evenhanded article describes the author's experiences as a barista, both in her hometown and in New York before and after college. She traces the similarities between the corporate atmosphere at Starbucks, which had engineered a formula for turning their stores into a "third place," an oasis between home and work, and the independent coffee shop she worked for in rapidly transforming Greenpoint. As a writer who came out from behind the counter to join the creative class that she had spent years serving, Osberg doesn't push too hard but persuasively brings to light the service economy that undergirds gentrification.